The Yeehaw is a 3D printer aimed squarely at the young geeks market. The company’s Indiegogo campaign, launched today, carries a $249 early-bird price tag and promises to ship the first 50 units in time for Christmas, but there were a few things about the company’s campaign that gave me pause. The printer has been especially designed with safety in mind, with door-open and tilt sensors shutting off the printer right away in case some inquisitive little fingers get a little bit too close to the hot or moving parts. It is also self-adjusting, automatically updates itself and has automatic calibration built in. The printer has a Wi-Fi connection and can be operated using an app or via a web interface. Yeehaw is throwing itself into a market that’s had a lot of activity, but not a lot of success so far. XYZprinting’s DaVinci miniMaker is available at $229, but doesn’t appear to shield its moving parts too well. Mattel’s ThingMaker is an interesting version from the well-known toy giant, but was recently delayed until 2017. Kickstarter-funded MiniToy ran into some delays but is supposedly shipping around the end of the year. What exactly are they made from? No, seriously. The product’s Indiegogo page promises “a library of more than 2,000‭ ‬ready-to-print toys‭” and that “All your favorite characters‭, ‬games‭, ‬and building blocks are immediately accessible‭,” which is undeniably exciting. Having said that, the kids I know are pretty demanding about who their “favorite characters” are. While the Indiegogo page does feature a blocky character who looks an awful lot like Mario, there aren’t a lot of recognizable characters from the likes of Disney, Pixar or the other well-loved heroes of kids TV. Attempting to take a closer look (by following the Indiegogo campaign’s advice to “Just search Yeehaw 3D”) resulted in disappointment — the app doesn’t appear to be available on the app store yet. It’s hard to say what the 2,000 models are that will be available. 3D-printed Batman inside the Yeehaw printer. The company says “Yehaw’s [sic] library currently contains about 2000 open-source 3D printable objects that are royalty free under a Creative Commons (Share-Alike) license and that have been gathered from various online sources.” Which makes a lot of sense, but would pretty much guarantee that your kids’ “favorite characters” aren’t going to be available. Copyright laws are pesky like that. The press materials supplied by the company included photos from the Cork Pals and SkullBot Thingiverse pages, which are both licensed under Creative Commons licenses as long as the models are attributed. Neither were, which is an issue. The models may be licensed under Creative Commons, but the photos themselves may well be copyrighted, which is why I haven’t included them in this article. 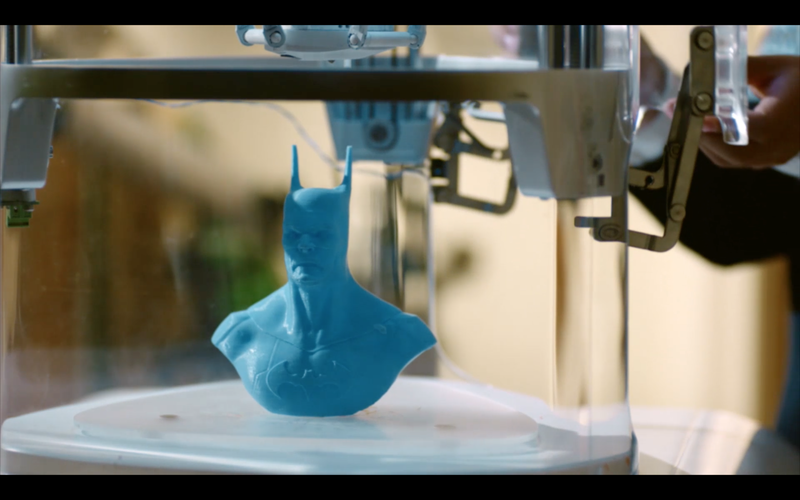 The Batman bust shown in the company’s Indiegogo video is also unattributed, also from Thingiverse under an attribution license. It is worth pointing out that nobody can realistically stop you from creating your own “tributes” to your favorite Disney, Marvel and DC Comics characters and 3D printing them yourself, but technically, you risk running afoul of the “derivative works” part of copyright law. Distributing Creative Commons models of Batman figurines through an app is taking that a step further and may prove problematic. DC Comics started officially licensing its characters for 3D printing via Launzer last year, and the company has been aggressive in pursuing companies creating replica Batmobiles and hunting down the Valencia football club’s new spread-wings-bat logo. I am not aware of any cases where character owners have gone after 3D model distributors, but it’s fair to assume that if DC, Marvel and company see a serious downturn in figurine sales, they may just spin up the lawyering machines. That’s… not a time-lapse video, but a 3D-rendered simulation. Why?! The early-bird printers are priced at $250 and the company claims they will deliver in time for the holidays, but if that is to happen, there is a lot of work still to do. The company has a tremendously slick Indiegogo campaign video (embedded below), which weirdly enough doesn’t include much video footage of the kids interacting with the printer, or showing the printer actually printing anything. In one part of the video, what appears to be a time-lapse is quite obviously a 3D render. I’m not saying the printer doesn’t work — the company’s PR representative showed me a printed figurine — but I’m not sure why the company felt the need to fake a video of the printer in action. I like some of the innovations on the printer; the idea of using “emotion lights” as status lights to indicate what the printer is up to, and making the printer fully see-through for educational purposes is a great idea. The $500 retail price is pretty steep, even if it is kid-safe. I can’t help but wonder whether instead of investing specifically in a printer that’s safe for children, it makes more sense to teach kids some basic safety rules. You wouldn’t let your 10-year-old near the power tools without some basic safety lessons, for example. There are cheaper printers out there, and there are tried-and-tested printers in the sub-$500 category (like the FLSHFORGE Finder at $499, or the MOD-t 3D, which carries a $300 price tag), so it’s tricky to see where Yeehaw really fits in. Ultimately, the campaign itself is setting off a number of alarm bells with me, both in terms of delivery date, whether the printer can do what it claims, what the provenance and availability of the printable models are and whether it is able to legally be marketed to children in the U.S. before it starts shipping. On the whole, I’d be hesitant to recommend it outright, but have a look at the Indiegogo page and make your own judgement. If the project does everything it claims, it would be a present that would literally* blow the mind of 13-year-old me.